Product prices and availability are accurate as of 2019-04-18 19:34:33 UTC and are subject to change. Any price and availability information displayed on http://www.amazon.com/ at the time of purchase will apply to the purchase of this product. 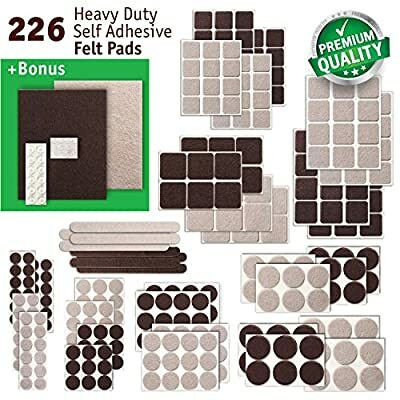 These premium furniture felt pads are made of strong eco-friendly material with recycled fibers and tenacious 3M adhesive, durable and soft, perfectly protect your home furniture and floor. Great gift for friends and family. A lot of sizes fit all of home furniture and items. Creates strong shield between floor and furniture, protect surface from scratches and scuffs. Easy to stick on, and easy to tailor to better fit your sizes. - Material: Durable soft eco-friendly felt and 3M adhesive. - Function: Anti-slip and prevent scratches. - Easy to stick on and not easy to fall off. - There will be no scratches and noise when moving your furniture. - Good choice for protecting your furnitures and floor. ?Package Include?Brown (169 piece) + beige (119 piece). Totally 288 chair glides, that's all furniture floor protectors you need at home, brown for dark furniture and beige for bright furniture. ?Diversity Sizes?Brown 169: (24) 3/8" Dia, (24) 5/8" , (24) 3/4" , (24) 1" , (8) 1-1/4" , (8) 1-1/2" , (4) 2" + square (24) 1" x 1", (16) 1-1/4" x 1-1/4", (4) 1-1/2" x 1-1/2", (4) 1/4" x 6", (4) 1/2" x 6", (1)4-3/4" x 6". Beige 119: (16) 5/8" Dia, (16) 3/4" , (16) 1" , (8) 1-1/4" , (8) 1-1/2" + square (16) 1" x 1", (16) 1-1/4" x 1-1/4", (16) 1-1/2" x 1-1/2", (4) 3" x 4", (2) 1/2" x 6", (1)4-3/4" x 6". A lot of sizes of chair leg floor protectors will fit all home furniture. ?Provide Best Protection?Our furniture coasters create strong shield between floor and furniture, desks & tabletops, which carefully protect surface from scratches and scuffs, provide best protection for your wooden, laminate or tiled floors. ?Widely Application?These wood floor protectors are perfect for any type of chair legs, furniture feet and other home furniture, electrical and other items. It's very easy to stick our felt floor protectors to your home furniture and items, suitable for any home furnitures. ?Strong Material and Tenacious Adhesive?Our chair floor protectors are made of strong eco-friendly material with recycled fibers. Tenacious 3M adhesive guaranteed you can easy stick it to any furniture surface and be sure it will hold on and protect for a long time.